Next weekend the Motion Picture Academy will present their Oscar awards and many are predicting the big winner to be La La Land, the story of an aspiring actress and an aspiring jazz musician who meet, fall in love and perform musical dance numbers in a world of semi-fantasy. Is La La Land the best movie of the year, worthy of the "Best Picture" Oscar? I do not believe so. But there is brilliance sprinkled through a film that, given a mediocre budget and moments of amateur filmmaking, not to mention flawless performances by the two leads, that puts me on the fence. My complaint is that all of the brilliance does not exceed or assist the story in any way. I could spot visual references to Hedy Lamarr, Singing' in the Rain (1952), Casablanca (1942), The Umbrellas of Cherbourg (1964), and other tips of the hat to screen legends. It is a known fact that Hollywood loves movies about Hollywood. Some of the best are Sunset Boulevard (1950), Sullivan's Travels (1941) and Who Framed Roger Rabbit? (1998). And that may be the sole reason why La La Land may be the big winner at this year's Oscars. I am not a fan of musicals but I did enjoy The Sound of Music (1964), Singing' in the Rain (1952), The Wizard of Oz (1939) and Chicago (2002) are those films were deserving of what awards they received. But a good musical, such as the movies I just referenced, requires the musical sequences to tell the story. You can tell a bad musical when you remove all the musical numbers and the story can still be told without the music. La La Land is a hybrid of the two. Ryan Gosling plays Sebastian, whose love for jazz is established by three separate musical numbers. Mia, the aspiring actress who is repeatedly rejected following one screen test after another, has no purpose for breaking out in song and dance -- her musical numbers are practically wasted during the movie. The opening number, "Another Day of Sun," in which dozens of people trapped in traffic congestion get out of their vehicles and break out in sing and dance is cute and clever (especially when you observe the entire sequence was one long shot without a cut from the editor's knife). You could tell the entire sequence was dance-choreographed and more remarkable when you realize how the entire sequence was shot during an actual traffic jam on the Los Angeles freeway. But remove that musical number and you quickly realize the movie would not be better or worse without "Another Day of Sun." Clever means nothing if you do not live in Los Angeles and have had to fight with the Los Angeles Freeway. Clever means nothing if it has no reason to be in the movie. Ryan Gosling certainly has charisma that benefits the camera. Here he proves he can play a piano, flip a hat as smooth as Frank Sinatra on the Santa Monica Pier, and sing as well as the professionals. But talent will only take an actor so far when they have no range -- Gosling is Gosling in every movie and La La Land is no exception. The standout performance is Emma Stone, playing the role of Mia, who delivers depth and range when performing in front of the cameras for multiple screen tests. 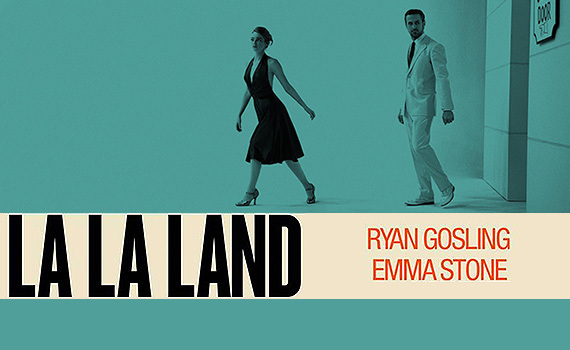 La La Land was nominated for a record-breaking 14 Oscars, tied with All About Eve (1950) and Titanic (1997). Whether the movie will sweep the awards or face aggressive competition (the latter of has happened at recent Oscar awards) is anyone's guess. There are moments each year when I leave the movie theater and accurately predict whether the film won Best Musical Score or Best Cinematography. I find myself sitting on the fence with this one. 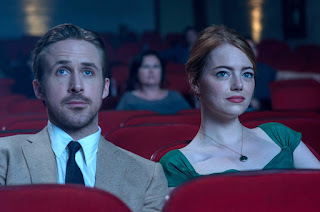 But La La Land gives the appearance the film was shot with low budget on location in California, directed by an amateur filmmaker. (It is as if the director watched dozens of vintage movies and said, "I want to film a sequence inspired by that movie" and filmed one scene after another with different costumes, color tints, and so on.) It is the editing and special effects that gave polish to the finished product much like an amateur writer who relies on the editor of a magazine to tweak his piece to provide the illusion of English Major 101. 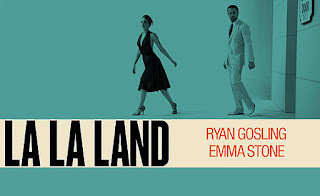 Even with bright color schemes and three superb songs that are worth adding to your YouTube Playlist, La La Land makes me wonder if this is one of those years when popularity gives rise to awards. Will La La Land bring about a resurgence of Hollywood musicals? I doubt it. But if La La Land is the latest motivation then we have to hope today's filmmakers look back at the days of when musicals actually told a story. La La Land is no prime real estate as an Oscar contender. Perhaps the movie stands out because the other contenders are so artsy that, as a friend of mine aptly put it the other day, "I never heard of them." Me? Give me Bette Davis in All About Eve any day of the week.